Turning 30 is a monumental event. Let's celebrate the occasion by hosting a celebration. Decorate the walls of your birthday party with this "30" Foil Silhouette. This inexpensive party supply is also perfect for couples celebrating their 30th anniversary. 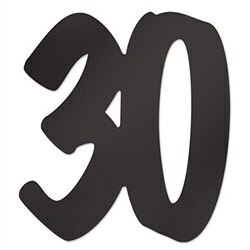 This "30" Foil Silhouette can be used to decorate tables, and other handmade decorations like banners or signs.